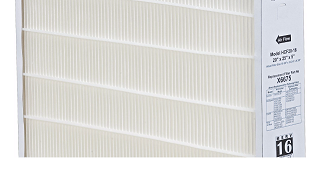 Carbon Clean 16® (MERV 16) Box Filters Disposable, pleated MERV 16 filters (Minimum Efficiency Reporting Value based on ASHRAE 52.2). 50% first-pass reduction of ozone. Carbon coated fiber matrix reduces odors. Hospital inpatient care/general surgery level filtration. Removes over 95% of E1 (sub-micron) particles down to 0.3-1 microns. Removes over 99% of E2 particles down to 1-3 microns. 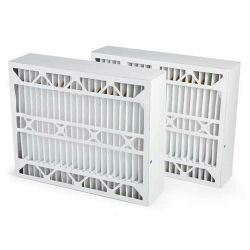 Removes over 90% of ultra-fine particles down to 0.01 micron, including viruses and bacteria. Filter is certified to UL 900 standard for flammability only and Class 2 in accordance with ULC S111.